Street Fighter has come a long way since it debuted at the arcade gaming scene back in 1987. Over the years since the characters roster has been updated regularly, the visuals have improved, fighting moves and combos have been refined, and new features have been added. However, despite carrying all the hallmarks of a great fighter, Street Fighter V is more of a deja vu than jamais vu. Now whether that's a good or not depends entirely on just how much you like Street Fighter. Related reading: Nick's full review of the game's predecessor, Ultra Street Fighter IV, on the PlayStation 4. The fifth numbered title in the series (but by no means the fifth game in it), Street Fighter V's aesthetics are definitely an improvement over IV. It might very well be the best looking fighting game of recent years - and I'm also taking into account the utterly stunning Mortal Kombat X (Dead or Alive 5: Last Round. Always gonna win - ed). Eschewing the full-blown cel-shaded cartoon style of its predecessor, Street Fighter V instead employs a muted version of the style and somewhat hyper realistic graphics with gorgeous 2D hand drawn cut-scenes. Comprised of static backgrounds with fixed character positions, the cut-scenes are possibly the game's best and most attractive feature. A good part of me wishes the entire game had been of this style but that would also mean to suggest that the rest of the game isn't pleasing to the eye at all. That couldn't be any far from the truth. 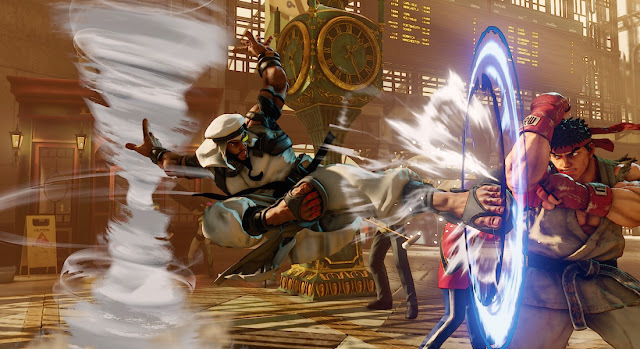 However, Street Fighter V doesn't do much with its gameplay to hold your attention for long. In more ways than one, it is a typical Street Fighter experience that only does more of the same already done by the previous instalments. You have your ridiculous combos, stilted storyline, awkward dialogues (Ryu's constant "I felt something in my fist" is just plain laughable; even Ken is puzzled by this), and painfully exaggerated character personalities that make you wonder whether Capcom really respects its fighters or not. All of this is nothing we haven't seen before: as such, the single-player campaign (perhaps unsurprisingly) isn't worth the player's time. Even the introduction of four new characters - namely Rashid, Necalli, Laura, and F.A.N.G - failed to grab any real interest from me. Maybe I'm being unkind (they ARE new, after all), but I will say that I'm genuinely pleased with the introduction of Rashid, an Arabic fighter from the Middle East. Note that Rashid is not the first Arabic character in the Street Fighter roster; that honor belongs to Pullum Purna, who was introduced in Street Fighter EX way, way back in 1996. Rashid is depicted as obnoxious, goofy and tech-savvy, and that's perfectly fine but Capcom is treading a fine line with caricature-style racism with this guy. The Street Fighter series is usually better than this, though, and I'm hoping Rashid's role in the lineup does get rectified in future instalments because out of the four new fighters introduced, he has the most potential for standing out from the rest. For those playing offline and/or are experiencing stable connection issues, they will find very little to enjoy in the story mode. Basically this mode contains ten-minute long backstories for each character, separated in chapters. Oh, and you get to engage in a fight occasionally. I use the word 'fight' here very loosely; you press a few buttons and before you know it, the fight's over. While I do admit some character backstories are actually very well done (Zangief, Rashid and Chun-Li), and also how every character is connected (for example, Rashid & Ryu interact with each other in their respective stories while the former's servant, Azam, is depicted as an old buddy of Zangief), the extremely short length and zero challenge leave a lot to be desired. Plus, they all play out in exactly the same way, so you'll get bored pretty fast. From there, all that's left is the online multiplayer. Though I've had one too many marathons of couch multiplayer with my friends, I've never taken the fight online globally. Fighting with other players from across the world only amplifies my awkwardness around fighting games. And because Street Fighter V is just unplayable on a keyboard - given the many buttons one must press in order to pull off a combo - it's safe to say I've lost more games than I've come very close to winning - so if you are going to get into this one, you are going to kit yourself out with a proper arcade stick. Still, the fun is present and is infinite times more rewarding than the single player campaign. As of writing this review, the online aspect is still finicky. Servers half the time don't respond, you're automatically disconnected mid-fight, wins and losses are not accurate, and in one instance I was straight out told I couldn't make my own server. But when you do get around to creating your own and/or entering a vacant one, the fun and excitement is all too real. I just wish that that one player from Canada did not rely too much on the poison projectile attack of F.A.N.G because I came extremely close to popping a vein and overturning the desk I was sitting on. Related reading: For an example of just how good fighting games can be with the narrative now, check out BlazBlue. Matt's review of the PS4 version of the game here. 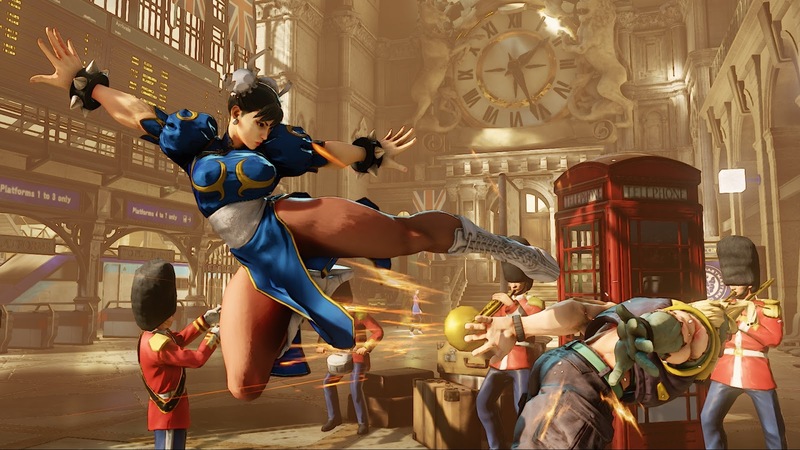 Street Fighter V looks and plays exactly like how you'd expect any instalment in the series to, but there's something unfinished about it, something that makes you feel the series has taken a giant step backward. Where other fighting games are working hard to develop themselves into adequate single player experiences, the single player campaign is virtually non-existent. Where netcode is absolutely essential for online multiplayer, this one is far from perfect. And, really, when even the most niche fighting games are getting a proper handle on all this, it's completely unacceptable for the premier fighting game of all not to do the same.